Texting is a great tool for almost any marketing campaign, helping to connect with your potencial customers and invite them to talk with your brand. Your team can deploy automated processes or responses (BOTs) for support inquiries, common customer questions, and the collection of valid contact information. For custom messages, you don’t have to worry, because you can manage it from any type of device. 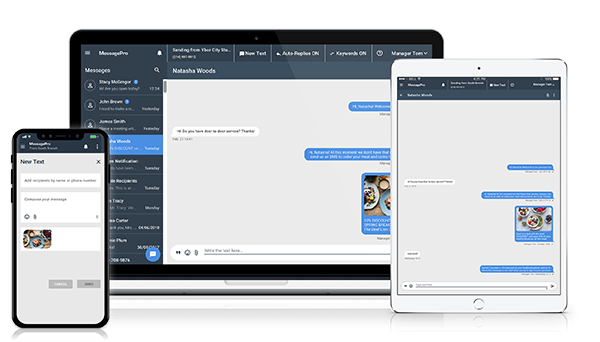 MessagePro Office helps to manage the number of messages sent from each phone number and handles all stop requests automatically. Also includes a great logging and reporting. Texting has been a great addition to our marketing campaigns. Engagement is high with great open and response rates. Much better than email marketing, even with opt-in only lists. Want to Know More About MessagePro for Marketing? Let’s Talk!